(v. 1) Who has believed what we have heard? And to whom has the arm of the LORD been revealed? (v. 2) For he grew up before him like a young plant, and like a root out of dry ground; he had no form or majesty that we should look at him, nothing in his appearance that we should desire him. (v. 3) He was despised and rejected by others; a man of suffering and acquainted with infirmity; and as one from whcommom others hide their faces he was despised, and we held him of no account. (v. 4) Surely he has borne our infirmities and carried our diseases; yet we accounted him stricken, struck down by God, and afflicted. (v. 5) But he was wounded for our transgressions, crushed for our iniquities; upon him was the punishment that made us whole, and by his bruises we are healed. (v. 6) All we like sheep have gone astray; we have all turned to our own way, and the LORD has laid on him the iniquity of us all. (v. 7) He was oppressed, and he was afflicted, yet he did not open his mouth; like a lamb that is led to the slaughter, and like a sheep that before its shearers is silent, so he did not open his mouth. (v. 8) By a perversion of justice he was taken away. Who could have imagined his future? For he was cut off from the land of the living, stricken for the transgression of my people. (v. 9) They made his grave with the wicked and his tomb with the rich, although he had done no violence, and there was no deceit in his mouth. Holy Communion commemorates Jesus’ redeeming grace, celebrates God’s limitless love, and anticipates the day when the faithful will eat and drink at heaven’s welcome table. Bread, wafers, or crackers represent Jesus’ broken body. The use of wine or (more commonly) grape juice symbolizes his shed blood. The various designations of Holy Communion include: the Lord’s Supper, the Last Supper, and the Eucharist. The term “Eucharist” is derived from a Greek verb meaning “to give thanks” (eucharisteo). Across the centuries, Christians have come to the communion table with great gratitude for Jesus’ ultimate sacrifice at Calvary. Among African Americans, this gratitude expresses itself creatively. For some African American congregations, Holy Communion is a solemn occasion with exquisite attention to detail. Deacons or stewards are meticulously dressed in black, and missionaries and deaconesses or members of the Altar Guild wear white. The white linen cloth covering the elements on the communion table is carefully removed and folded. The distribution of the elements proceeds with military precision. Trays of bread and cups move seamlessly from the pastor to the lay leaders to the congregation, as soft organ music floats through the sanctuary. In other African American congregations, Holy Communion is a more festive affair. As the meal is being distributed, a sainted elder in the congregation shouts the familiar words of a song, such as, “I know it was the blood for me.” Then the organist, choir, and entire congregation lift that song until hands start clapping; feet begin tapping; bodies begin swaying; tambourines start rattling; and souls get happy: “I know it was the blood…they pierced him in His side…He never said a mumblin’ word…He hung His head and died…He’s coming back again…one day when I was lost He died upon the cross…I know it was the blood for me.” In the folk language of our ancestors, this beloved song narrates the Lord’s suffering, death, and certain return. Acts 2:46 suggests that early Christians shared Holy Communion daily, while Acts 20:7 records the weekly celebration of this sacred meal. My own background reflects these different understandings about how frequently Holy Communion should be served. I was ordained in a Baptist church in the South that observed Holy Communion at the end of the second Sunday morning service. The Midwest congregation where I worshiped while in seminary observed Holy Communion as a separate monthly evening service. Today I am Associate Pastor of a Christian Church (Disciples of Christ) congregation that hosts the Lord’s Table weekly in the middle of the morning worship service. Holy Communion as an “ordinance” or “sacrament” is in many ways related to the frequency of its observation and its placement in the worship service. For the most part, those who observe Communion as an “ordinance” host the Lord’s Table monthly, while those who employ “sacrament” language serve Holy Communion more often. Both approaches affirm this celebration as crucial to the development of Christian faith. Whether we partake of Holy Communion once a week, once a month, or even once a year, we are still reminded of the Suffering Servant who lived, died and rose again that we might be redeemed from sin once and for all! Isaiah 53:1-9 is a part of Deutero or Second Isaiah (Chapters 40-55). At this stage in the prophecy, God tells Israel that it has paid double for its sins and will receive comfort. The historical framework for this text is approximately 540 BCE. Israel is nearing the end of the Babylonian exile. The return to Jerusalem is imminent. Yet while on the verge of deliverance, Israel neither sees the end nor senses God’s presence. There are four “Servant Songs” that speak to Israel or Jacob as God’s chosen servant who must bear the consequences of its own wrongdoing and also bring justice to and for the nations (Isaiah 42:1-4, 49:1-6, 50:4-11, 52:13-53:12). Israel in Isaiah 53:1-9 suffers on behalf of others in order to atone for sins and redeem the nations. As noted, this last “Servant Song” begins at 52:13 and divides into three literary stanzas: 52:13-15, 53:1-9, and 53:10-12. In the first and last stanzas, the Lord speaks of restoring and exalting Israel, despite its agony and embarrassment. In the middle stanza, those speaking are the ones for whom Israel suffers. This middle stanza further divides into three sections: vv. 1-3, 4-6, and 7-9. The sections are full of irony. What occurs is the opposite of what is perceived and expected. In vv. 1-3, the nations express disbelief about God’s promise to restore Israel. There is a rumor afoot about the restoration of Israel’s splendor. Nevertheless, Israel’s troubled past and diminished present seemingly have invalidated hope in this promise. Yet the people concede that God is strong enough to accomplish this; for there is wonder-working power in “the arms of the Lord” (v. 1). The divine irony is that God daringly uses what appears to others as useless. Verses 4-6 describe the brokenness of Israel as a result of its service to God Herein is another irony–divine purpose even disfigurement. Out of Israel’s bad condition, the nations receive good consequences. From punishment, there is peace. Suffering brings shalom, a state of wholeness and well-being. Through stripes and bruises, come healing. The last section (vv. 7-9) expresses more of the ironic or peculiar nature of Israel’s service to and relationship with God. Although Israel is oppressed and afflicted, it does not cry out. Its service calls it to restore justice; yet it receives no justice. While Israel dies for people, it is uprooted and cut off from humanity. Even in death, there is still no rest for Israel, for it is buried with the wicked and dishonest. There is no deceit in its mouth; however, its grave is with the deceptive. In light of the similarities between Israel as the suffering servant and Jesus as the suffering Messiah, first century Christians interpreted Isaiah 53:1-9 for their contexts. New Testament literature alludes to and quotes excerpts from this “Servant Song” (for example, Matthew 8:17, 26:63; John 12:38; Acts 8:32-33; and 1 Peter 2:21-25). Additional parallels include Jesus’ silence before Caiaphas (Isaiah 53:7; Matthew 26:63) and Joseph of Arimathea as the rich man who provides the tomb for the suffering servant (Isaiah 53:9; Matthew 27:57). Given the emphasis on suffering in this passage, preachers need to distinguish carefully the causes and consequences of suffering. There are occasions when suffering–or at the very least struggle–can produce righteous results. But there are many other occasions when people become victims of suffering through no fault of their own, but rather through the sinful behaviors of others and the unjust structures of the society. For instance, the bodies of many black women are “stricken,” “wounded,” “crushed,” and “bruised” in domestic violence and sexual abuse. To sanction that kind of suffering by uncritical homiletical application of Isaiah 53 is sinful! On the cross, Jesus was despised, so that we might be valued. Jesus was rejected, so that we might be accepted. Jesus bore our infirmities, so that we might be healed. Jesus was bruised, so that we might be blessed and be a blessing to others. As we partake of his “broken body,” let us strive to fix the world. As we partake of his “spilled blood,” let us rid the world of bloodshed and violence. Textures: Smooth leaves, rough ground, wooly sheep, sheared sheep. 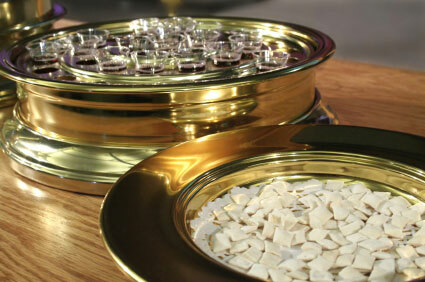 For more information on Holy Communion services, consult Segler, Franklin M., and Randall Bradley. Understanding, Preparing for and Practicing Christian Worship, 2nd ed., Nashville,TN: Broadman and Holman, 1996; and see the Cultural Resource section of this website. Experience. Maryknoll, NY: Orbis Books, 1998. p. 124. Brown Taylor, Barbara. The Preaching Life. Cambridge, MA: Cowley Publications, 2003. pp. 32-33.